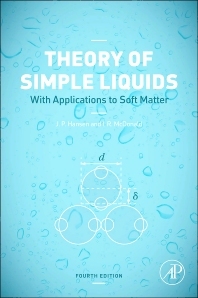 Widely regarded as the standard text in its field, Theory of Simple Liquids gives an advanced but self-contained account of liquid state theory within the unifying framework provided by classical statistical mechanics. The structure of this revised and updated Fourth Edition is similar to that of the previous one but there are significant shifts in emphasis and much new material has been added. Expansion of existing sections on simulation methods, liquid-vapour coexistence, the hierarchical reference theory of criticality, and the dynamics of super-cooled liquids. New sections on binary fluid mixtures, surface tension, wetting, the asymptotic decay of pair correlations, fluids in porous media, the thermodynamics of glasses, and fluid flow at solid surfaces. An entirely new chapter on applications to 'soft matter' of a combination of liquid state theory and coarse graining strategies, with sections on polymer solutions and polymer melts, colloidal dispersions, colloid-polymer mixtures, lyotropic liquid crystals, colloidal dynamics, and on clustering and gelation. Expansion of existing sections on simulation methods, liquid-vapour coexistence, the hierarchian reference of criticality, and the dynamics of super-cooled liquids. Suitable for researchers and post-graduates in the field of condensed matter science (Physics, Chemistry, Material Science), biophysics as well as those in the oil industry.